Sediment-laden discharge from construction sites can contribute considerable deleterious silt into our waterways, damaging fish habitats and affecting our water supply. Erosion and sediment control is crucial to protecting the environment. The Gemco team has many years of experience operating ethically in environmentally-sensitive areas. Gemco operates in most municipalities in the Lower Mainland of British Columbia. Our experienced staff knows the technical specifications of each municipality, and how to match the best construction methods with the highly variable soils encountered in our area. We know the best practices for efficiency, production and environmental protection when we bid on a project, and implement them during construction. 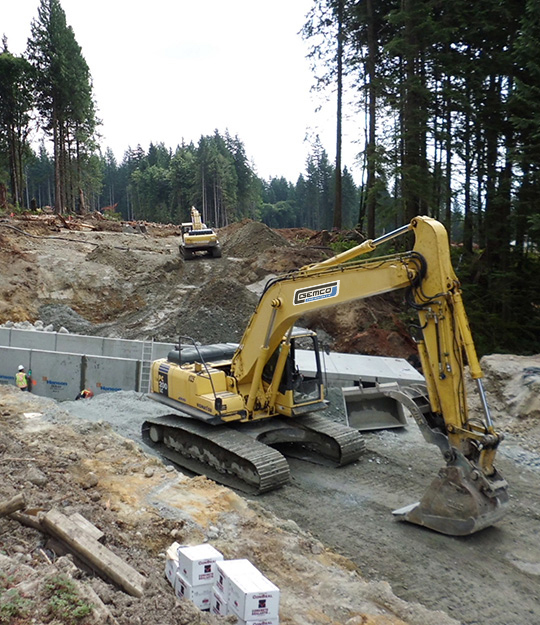 Construction of a spawning channel for returning salmon in Coquitlam. Environmental controls include +300,000 m3 of embankment fill, polyethylene sheeting with slopes strawed and hydroseeded for winter season and detention ponds to control rain run-off. Lower culvert manages water flow from the creek and upper culvert is for wildlife. Straw and wattle protect the slopes from erosion until permanent planting is complete.